As we are getting older, we review our style in clothes and hair ‘dos which is quite normal, since looking the same for decades is rather boring, dated and unstylish. A woman doesn’t stop being a woman with age. Changing looks and experimenting with styles is in her nature. However, with years we strive for more comfort, and short hair is a good base for low-maintenance hairstyles which look stylish and aren’t perceived as “old woman’s helmet-like ‘dos”. Here are 90 great images with short hair. Do you need to stick to any specific rules when choosing hairstyles if you are older than 50? Only partly. Generally to look stately and elegant, it’s recommended to comb your locks back, opening your face. Excessively shaggy hairstyles may appear sloppy and awkward. Bangs are ok, they make you look younger, but try to keep them neat and thin or styled to one side so that your forehead is not completely covered. Consider lighter hair hues, and you will easily take years off your face. Some older women look extremely flattering with silver hair. If you are not the lucky one, think of brown to blonde solutions or highlights. Other than that, you may stick to general recommendations on the choice of hairstyles, i.e bear in mind your face shape and hair texture. Fine hair looks cuter when cut short and layered, while thick coarse tresses feel better in elongated cuts. They don’t have to be long. 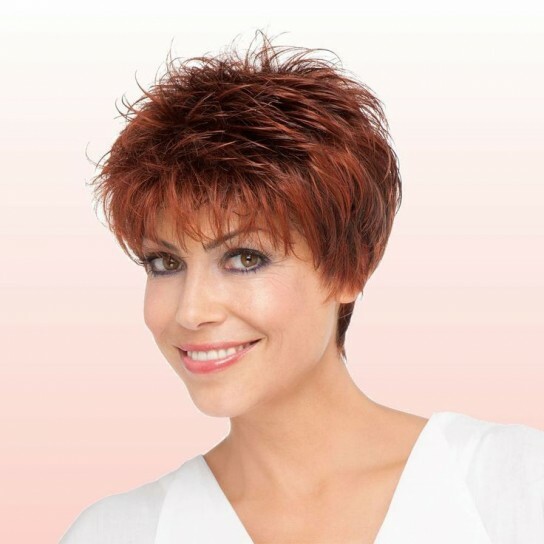 Lisa Rinna’s type of short-to-medium hairstyle is a very good option for thick hair. Below there are the brightest examples of short hairstyles for older ladies you can come across in Internet. Pixie cuts are a popular variant for older women, thanks to their mix of ease and playful style. Choppy layers are a perfect way to add texture and dimension to the classic cut. Texture is key to keeping your look youthful and not staid. The only way to create shape within short haircuts for women is with an expert layered cut. If you have straight hair, you can give it extra body by flipping out the ends with a large barrel curling iron. Short haircuts for women are a good choice when you’re looking for something low maintenance. You don’t have to worry about searching for lost hair ties anymore. What’s more, the short cut is sassy and shows that style always comes first, despite your age. Too often, women keep their hair long even though the length may not be flattering. If your stylist recommends going for a chop, don’t panic. A right pixie cut can not only give a younger appearance, but it will save hours of styling time in some cases. In your senior years, embrace the beauty of silvery strands. It’s a beautiful hue that millennials often turn to themselves. To add even more drama, be sure to tease those cute feathered layers. Older women sometimes experience softness in the face as they age. An angled cut adds sharpness to the curved edges and draws attention to the narrowness of a pointed chin. Hairstyles for older women can use graying hair to their advantage. If you go for a platinum hairstyle, the color perfectly masks any pesky grey, so that you don’t have to worry about constant touch ups. Pump up the volume with a few piecey layers. It creates movement, and you can fully enjoy rocking your beautiful feathered hair. Rounded bobs are a classic choice for mature womens haircuts, as they are full of elegance and sophistication. Build an enviable height around the crown of your head when you are blow drying with a round brush. Pixies with an undercut show us how short hairstyles for women over 50 can come packed with a punch! Luscious waves soften the edgy cut, giving the hairstyle a sassy aesthetic. The pixie is one of the most popular short haircuts for older women. This is because it adds texture and a tousled finish to thin hair. If you team the pixie with long side bangs and choppy layers, you can easily create a style that’s fun, youthful, and easy to manage. Result! Women can rock the traditionally masculine undercut just as well as any man could. Make it feminine with a long, straight top, and a blonde hue with ample highlights. To dial up the volume (and avoid the page boy look), have your stylist add in subtle layers. Textured fine hair can benefit from a pixie cut. Worn in a natural salt and pepper coloring, curls appear bouncy and fluffy. Enhance this youthful essence by leaving a longer face framing strand on your forehead and styling with mousse or water based wax products. Feathered hairstyles generate soft, fluent looks for short and lackluster locks. They also add dimension to your hair while still allowing easy maintenance. Simply apply a smoothing cream to your bed head and you’re good to go for the rest of the day! Who said senior ladies can’t rock punk inspired ‘dos? Simple but statement making, the layered pixie with textured bangs suits straight hair perfectly. Top off with streaks of your favorite fun colors. For ladies who are struggling to keep their hair luscious and rich in color as they age gracefully, the airy gray pixie might be the style for you. Images show that it entails lots of layers to keep your locks looking funky and stylish. It also exposes your ears enough to make room for some dazzling statement earrings for smarter occasions. While bob is a staple haircut, there are countless ways to make it unique to express your personal style. Have your hair cut at an angle for some drama. Then, opt for loose, tousled curls to enhance the volume. Accentuate your beautiful gray locks with a balayage that brings more depth to the cut. Out of all haircuts for older women, pixie bobs are arguably the most popular. Give your pixie cut some edge with a nape undercut that brings individuality and spice — formal in the front, modern party in the back! Delicate layers soften any bob and appear extra feminine when worn in a clear, shiny gray. If you have thin hair, consider this hairstyle, as the white highlighted pieces give enough dimension and sophisticated appeal to your hair, making it fuller and visually more interesting. One of the prettiest hairstyles for older women, this cut is perfect for those with authentically curly or wavy tresses. Feminine and chic, it looks fabulous with any color, complements the natural grain of your hair, and allows you to style with ease. Short hair doesn’t limit styling options that much — adding a textured crown to your pixie is a simple but effective way to smarten up your cut. Perfect for professional environments, tapered cuts look particularly vivacious in salt and pepper. From Audrey Hepburn’s to Anne Hathaway’s, the pixie cut has become a by-word for chic hair, it’s endlessly elegant with just the right level of nonchalance. A slight update of the old style goes a long way. Experiment with texture to add a modern twist to this classic crop. With trendy highlights, shorter hairstyles for older women instantly become contemporary, without being faddish. Short haircuts for women over 50 should look contemporary to take years off your looks. For instance, this style has side bangs, a mildly defined taper, and textured layers around the crown — customizations can completely alter the look of your tried and true pixie! Don’t just throw out the rulebook, burn it. Fun, fashionable hair is no longer just for the young. Whatever your age, it’s time to experiment and go as wild as you like with your short haircut. Leave your self-doubt at the door and step your style up a notch with pastel highlights. Very short hair doesn’t flatter everyone. If you prefer longer hair is short styles, keep your cut on the lengthier side with a chic pixie bob. A trendy light color like platinum, gray or ash blonde will illuminate your face and prove to be low maintenance if you want to cover natural grey hair or make it look purposeful. There’s something timeless about a good bob hairstyle. This shorter take blends the classy look of a bob with an edgy pixie cut. The end result is incredibly chic. Invest in a good flat iron as the styling will take a little time. You want to get all of those layers smooth. One can never go wrong with a one-length bob. Minimal layers create a cute shape to your cut. It’s short hair that still can be styled in different ways – straight curly or wavy. A modern balayage color will make the style completely current. To create a fashionably elegant and sophisticated look, you can opt for a simple layered bob. If you ask your hair stylist for long V-cut layers, this adds texture and body while simultaneously taking the weight out of thick hair. When the color of your hair looks like a blend of your natural hue and gray, it’s known as the “salt and pepper”. It’s undeniably striking in layered and tousled bobs. Designed to appear messy and effortless, they suit almost every face shape and skin tone. A tailored pixie has been #1 on the “short haircuts for older women list” for a while. What sets this one apart is the detailing. Notice the deep side part that leads to a fun bang and the two tone coloring. The highlights are rich in the front to not draw too much attention to the face and then get sparser in the back to add some dimension. Short haircuts are usually completed with short, medium or long bangs. Next time you’re at the salon, make sure you ask your hairstylist for a side-swept fringe. With a layered short cut, this will instantly slim and flatter your face. Go to the ashier range of blonde for a more subdued vibe that still carries just as much impact as bolder images. Fine hair benefits from a longer cut pixie with short structured layers in the back. Don’t be afraid of the grown in roots look — it makes your hair appear thicker and adds to visual impact! Graduated haircuts are marvelous for mature ladies, as they ooze elegance and class. With age our hair may become finer, so graduated locks give the desired appearance of fullness and volume. Luckily today gray hair is popular as never before, and that means you can embrace your real hair color and flaunt it proudly. If your hair is fairly thick, pick a feathered cut and style it with a root lift that gives the desired volume and air. Short hairstyles for women over 50 have never been more elegant and modern! Silver has become a trendy color option recently for women of all ages. We can definitely credit our lovely mature ladies with being the founding mothers of this fad. The cool tone accentuates her blue eyes and pairs well with all short haircut styles. Angled layers in short hairstyles for older women bring edge and definition, which in turn give an overall youthful and fresh essence! It’s important to let a professional hairdresser guide you as to how to style your cut, so you can show off your chic balayage bob at its best. Thick hair can be extremely difficult to deal with and style on an everyday basis. The short haircuts for women over 50 that tend to work best when it comes to thick, coarse hair are those of the choppy nature. These cuts might be slightly less contemporary than others, but they’re so much easier to manage and care for. More versatile than the average bob, a jaw-length cut allows different styling options. This hairstyle produces the best visual results when left natural; however, it’s nice to have the option to curl the front pieces for dressier occasions. Pair with glasses to create a smart, classy everyday look. How do you transform a simple pixie cut into a head-turning style? Make it asymmetrical. This unexpected shape instantly adds drama and an elegant twist. It’s a great option for showing off your cheekbones. Pair with a rich metallic color and embrace that sassy silver fox you see in the mirror. Tight curls, loose waves – whatever the mix, don’t let your natural style droop. Have your hair cropped into layers to encourage your natural root lift to find its own direction. All curly short haircuts for women require a little help in the definition department, so purchase a smoothing serum for that added extra attitude. If you’re blessed with a thick mane, textured layers will be your best friend! Not only do they make your life easier (in terms of regular washing/styling time), they provide beautiful texture and fundamental structure to cuts. Use white hair to your advantage. It makes a great backdrop for the softest pastel colors without the tedious effort of bleaching and toning. Create fullness with short feathered layers and wispy fringe for a funky and fun style. For a quirky yet modern ‘do for short hair, ask your hairdresser for a choppy tapered pixie cut. The taper gradually shortens the length of your tresses from the top of your head down to the nape of your neck. It might be one of the shortest haircuts, but it sure is fashion-forward. Many believe that the babylights technique — where very fine, delicate highlights are woven throughout—is only for blonde hair. But, it can actually work for any color as long as you make the highlights a few shades lighter than the base. The result is the natural-looking shimmer like in the photo. Start with a classic short cut. This is a beautiful way to wear some older women hairstyles that will never seem too boring or stuffy. With a bit of product and a hair-dryer you can create a fresh and flirtatious short hairdo at any age. A pixie is a classic hairstyle and a timeless cut that always looks good. Tailor yours to suit your facial features and your personality. Her long side-swept bangs bring out her funky frames and amazing cheekbones. Pixies are among the most popular short hairstyles for women, but they best suit women with slim faces because they show off high cheekbones. Cropped cuts are perfect for older females because they provide texture for limp thinning strands. Curly and wavy hair styles offer movement while softening facial features — which is crucial to women concerned about fine lines or wrinkles. Staying away from rigid cuts and styles makes you look younger. Hairstyles for older women are usually full of layers — varying lengths builds volume and boosts texture. Looking extra sweet in honey blonde, add grain with texturizing sprays and maintain luster of locks by using shine sprays. Silver hair makes a striking statement in super short styles because it looks cool and chic at the same time. To create depth, mix in a dark charcoal hue at the roots. A more traditional cut for women over 50 may be the right fit if lean more towards the classic style. Don’t forget to show off all the piece-y layers by accentuating them with highlights! Short edgy pixie with highlighted ends is effortless in styling and fabulous-looking in day-to-day wear. Besides, it’s a great coloristic pattern for gray hair in brunettes. You are going to look much younger, fresher and brighter. Raquel Welch is simply irresistible. Her edgy voluminous shag screams with beautiful texture and wonderful choice of hair hues. A nice lift at the roots and layers of flicks for fairly thick hair are exactly what it takes to achieve this fabulous effect. Fun texture and fabulous volume around the crown with tapered sides and the back create this incredible short hairstyle with a cute feathered finish. It bears just the right amount of sassiness to make an impression of a modern and active lady, is that you? A bob cut is above time, it’s elegant and classy. It’s a good solution of transition from long locks to shorter hairstyles which are, however, not extremely short. Pair it with thin bangs and consider illusive highlights for a modern quirk. Here is a layered chin-length haircut combed back to open the facial contours. Backcombing close to the roots and nonchalant bangs, caressing the forehead, bring this sweet look to perfection. Fine tresses seem thicker when cut short. With brown blonde coloristic solution like this and subtle backcombing you’ll add some more body to your short tresses. Style them backwards for a gorgeous elegant look with a tint of carelessness. 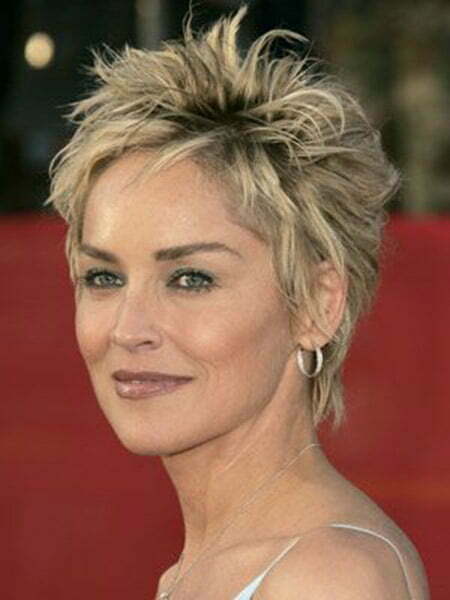 Sharon Stone demonstrates one of the most inspiring examples of short hairstyles which are sassy, stylish and quite acceptable over 50. This texturized pixie is enhanced with a few bold nonchalant spikes on top. I would recommend this to women with oval faces and regular facial features. Maybe you don’t want to embrace your grays. There is no shame in that! Go bold with a two-tone pixie: a blonde top and brunette bottom. Mix some darker lowlights through the crown to add dimension and tie the look together. When you are retired, you want a hairstyle that requires minimal effort and won’t need frequent trips to the salon. Short layers will retain the shape of the cut as it grows out. Plus, it doesn’t require much prep work in the morning—just brush and go. Show off your curls with an undercut. If you opt for a warm hue, use highlights to break up the color and accentuate the texture. Want to know how to style this look on your own? It’s as simple as a wash and go. Tousle your ringlets with a little bit of product to enhance the curl pattern. Many short hairstyles for women over 50 can require some serious styling time. A spiky pixie is an ideal way to keep your hair very short and manageable with minimum styling. Just make sure you have a styling wax on hand to separate and define the shortest layers. The sweeping bang softens the look without adding too much maintenance. Consider simple and classy short hairstyles for women over 50, such as the slanted bob. Also sometimes called the angled bob, this haircut is just as sleek as it is chic. Pictures show that it tends to work best for ladies with naturally straight hair as the angle is further enhanced when your locks are styled smooth. However, the slanted bob can also be styled wavy, curly, or textured for versatility. Women’s bobs can come in all shapes and sizes, with the inverted bob being a popular hairstyle of choice for younger, middle-aged and older ladies. It’s different from the classic bob based on the technique that’s used by your hairdresser to achieve this style. It’s all about stacking layers at the back and gradually elongating lines towards the front to create a unique, low-maintenance shape for those with naturally wavy tresses. Short layers around the crown of the head are key for adding volume to your cut. This is especially useful for ladies with a round face as the height will lengthen the overall shape. Adding some bold contrasting colors on the sides visually balances the volume on top. Intertwined shades of black and silver give the wearer a very natural-looking yet gorgeous style. Compliment this palette with an elegant short bob that features long feathered layers. Work some root lifting mousse into damp hair and blow dry it backwards with a round brush for added volume and polish. When looking through hairstyles for older women, focus on those that don’t make the face look too severe. As we age our features become sharper especially on slim women. Layers in several different lengths feathered away from the face will help to add movement and soften facial features. The iconic Jane Fonda is often seen with such a classy style. The mom-that-has-it-all-together ‘do. That’s the best way to describe this one. There’s nothing simple about this chic cut, as it has just about everything — long, sweeping strands near the face, short pixie layers at the crown, and the stacked bob back to ground the whole medley! Feathering is another way to update womens short haircuts. Reduce the stiffness of a more structured cut by using razor-cutting tools and by choosing subdued shades (like the forgiving salt and pepper) that aren’t harsh around your face. Guess it would be nice to refresh your traditional bob? Try a trendy asymmetrical style. This option works great with fine straight hair and can be used to draw attention to your beautiful jawline. Even Hollywood celebrities are often seen with a messy pixie. However, you don’t have to be a pop or a movie star to pull off this edgy style. The laid back color palette allows for a funkier finish without seeming over the top. Often our hair will begin to thin as we age. When looking at images of short haircuts for women over 50, we notice that layers are a recurring feature. The stacked lengths instantly add volume to the style. This is a blessing for women with fine hair. The pixie bob is one of the best short haircuts if you still want some length to play with. Stacked layers in the back are easy to manage, and the elongated pieces in the front frame your face nicely. Style straight for a crisp finish, or with waves for a bed head look. Mature women have the unique benefit of rocking platinum hair and still looking completely natural. Such a striking color can really stand on its own with no variation of shade. The cool tones will spotlight the workmanship that goes into the cut itself. Babylights are highlights that are very subtle and add a sun-kissed look to your coloring. Shown here, they lift the top layers to keep the style from looking flat. It’s a technique that can be used in all short hairstyles for older women and it’s especially useful if you have fine hair. A side-parted bob that sweeps across the forehead works very well to frame the face especially on women with glasses. Such a tailored cut turns out to be the perfect base for an unexpected pop of color. Thin streaks of purple are a gorgeous addition to a head of silver hair. A pixie with a messy finish is a great way for women with straight hair to achieve some movement. It’s also low maintenance in comparison to other short styles. A quick dry, a bit of styling wax, and you’re set. Chunky highlights will add drama and accentuate the varying directions of your locks. Shorter haircuts for older women with thick hair naturally feature lots of volume and texture. You have an option of going even shorter without looking flat. Pop culture is obsessed with taking things like “dad hats” and making them cool. Next up: the mom bob. Short hair cuts that typically have been styles of busy moms on-the-go are now desirable with many different age brackets. A nice mix of ash blonde and brown tones makes them modern. Meryl Streep redefined the asymmetrical bob in The Devil Wears Prada. The short length paired with a sweeping exaggerated bang screamed chic and was not off-limits for the main stream. There are many great pictures of this exact style floating around, so take a few to your stylist and tailor it to make it your own. Stacked hair styles are beneficial for women over 50 for a couple of reasons. First, by placing multiple short layers on top of each other you can achieve a voluminous bump. Second, they provide a modern and youthful edge to basic bob cuts. Modern short women’s haircuts never fail to deliver the perfect style for ladies of all ages. Especially if you are older, these styles should be on your radar. They are sleek, sophisticated, and age-defying. Take this bob pictured below, for instance. Timelessness is what makes it a go-to. The stacked bob delivers beautiful height to your hair. Bangs balance the tapered length in the back, while caramel highlights bring warmth to the brunette color. The chocolatey hue exudes youthful style that is simply irresistible. Next time you hit the hairdresser, make sure to ask for added texture. Why? Not just is it ‘cool’ but it’s wearable. It’s daring and youthful without being outrageous. And, it’s modern and interesting without requiring much maintenance – professionals suggest mussing a pixie cut with your fingers after a shower to get the right texture and some root lift. As a face ages, it is important to let the hair compliment its changing complexion. Softening the silhouette and shade of a short hairstyle for a woman can be just the solution to distract from the small effects of advancing age. Consider diffusing harsh blocks of your short hairstyle in a solid color with layers of warm and delicate dimensional hues for a fresh new spin on the pixie. Hair inevitably goes gray after a certain age, and it’s best to surf the silver wave rather than fight it. But, that said, there’s no need to totally embrace grey and live with it forever. With natural gray hair, your locks no longer need to be bleached to show color. So, you may try a light pastel shade and experiment with technicolor highlights. We vote for no more boring short hairstyles for women. Step up your classy blonde bob with the flick of an unexpected color. Reign supreme with a double-take purple streak, or pep your pixie up with a slick lick of pink. Here is a wash-and-go hairstyle that everyone will love. It even doesn’t need any styling products! Straight hair of decent thickness and an oval or triangular face shape are the requirements to pull this off. Long live rock and roll! You don’t have to commit to a whole head of a bright color, but just adding some colorful peek-a-boo highlights to your bangs injects a dose of edge into your classic short hair style. Here’s a wonderful example of a short women’s haircut inspired by TV icon, Carol Brady. We all know about her mock mullet. And although, that may not sound too stylish, it works well for older ladies. There are layers and volume on top tapered towards the cute feathers, covering the nape. Embrace the gray with a subtle balayage that brings dimension to your strands. The popular coloring will accentuate your hair’s high and low notes. Pair that with a sleek bob and you’re a bonafide silver fox. Dear ladies, we know how important it is for you to find a hairstyle that would look on you not only flattering but also present-day. Feel free to follow the examples above, check hairstyles of older celebrities and shy away the salons where they curl your hair into tight curls and overspray it to the crust. Your hair should look lively and not overly styled.